Start seeing red! 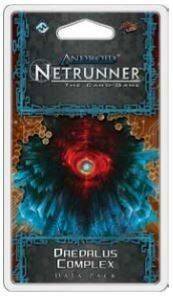 Android: Netrunner goes to Mars with Daedalus Complex and the Red Sand Cycle of Data Packs. Named after the foundation for a space elevator similar to the Beanstalk on earth, Daedalus Complex introduces sixty cards (three copies each of twenty different cards) that explore the red planet�s rugged, semi-lawless nature and the myriad opportunities for cybercrime that exist among its different factions. New run events, resources, ice, assets, and upgrades permit a variety of deck types, as does a new Weyland identity.